Christian Cross with Wings Large Back Patch measures 10.9x12 inches and is Embroidered in Black / Brown. The Large can be sewn on or ironed on to clothing. 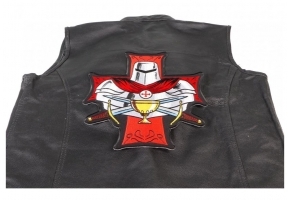 The Christian Cross with Wings Large Back Patch features plastic iron on backing and clean laser cut embroidered borders. 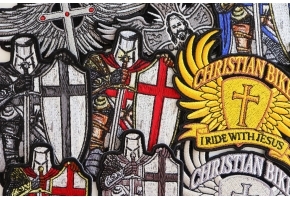 Christian bikers are sure to appreciate the intricate design of this absolutely beautiful patch. 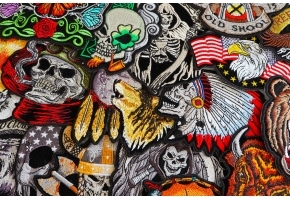 The truly exceptional embroidery brings this stunning patch to life and features impressive gold thread on a black background. The velvet fabric is soft to the touch while the Japanese iron-on glue makes this stylish patch easy adhere to all non-leather materials. 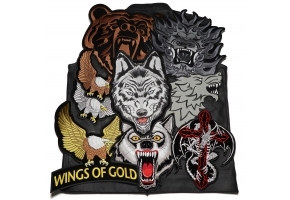 It comes available in both large and small sizes and can easily be sewn onto leather vests or jackets. 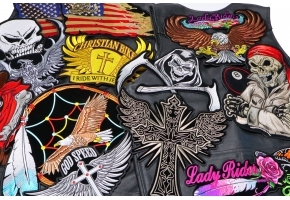 At times when you invest in a patch to be added on your jacket can steal your heart instantly because of the fabric with which it is made and also the kind of looks that it gives to the overall outfit. Cross Patch Large Christian Cross with Wings is a classic example of a patch which can leave you in a state of euphoria because of the design and the velvet fabric. The gold thread embroidery on a black background makes it extremely charming and it is suitable for everyone who is out there to create some interest in people with their clothes.